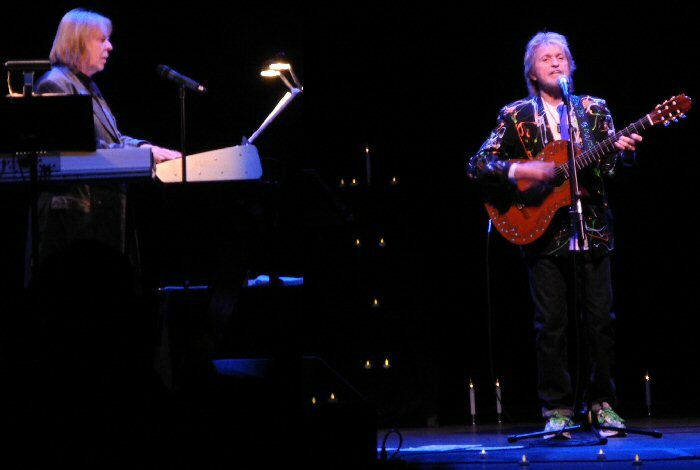 Former Yes band mates Jon Anderson and Rick Wakeman united for an enchanting evening of music at the Count Basie Theater in Red Bank, New Jersey on November 4, 2011. The Count Basie is an old restored theater with much character. The stage was stark with black curtains and electric candles placed around the stage and equipment. Gear was also scaled back with Rick playing 2 keyboards and Jon switching between two acoustic guitars. Jon Anderson and Rick Wakeman appear to be enjoying their time onstage in Red Bank. Jon Anderson is regularly referred to as the voice of Yes. Jon's naturally high range contributed to the band's signature sound. Anderson was the creative force behind many of the group's epics such as "Close to the Edge" and "The Gates of Delirium". Anderson's lyrics were often abstract dealing with mystical imagery and issues. In addition to his work with Yes, Jon has performed with many musicians including Bela Fleck, Mike Oldfield and Vangelis. Anderson has composed songs for soundtracks and recently Jon has been focusing on solo projects. In 2011, he released Survival & Other Stories. The CD was a compelling record that was a combination of other people's musical compositions and Jon's stories about survival. Rick Wakeman is well known for his work in Yes, a group that he floated in and out of over the course of its four decade history. However, Rick has left his notable mark on a number of the band's classic albums such as Fragile, Close to the Edge and Tales From Topographic Oceans. Wakeman is a prolific solo artist who has produced over 100 albums that have sold millions of copies. Rick plays an assortment of instruments including the electric and grand pianos, organs and synthesizers. In 2010, Rick collaborated with Jon to record nine new songs. The result was The Living Tree, which has been described as stark yet stunning. The two also started touring together, which brings both band mates to the fall of 2011 performing live in the United States and Canada. Candles helped set the ethereal mood for the music of these two living legends. 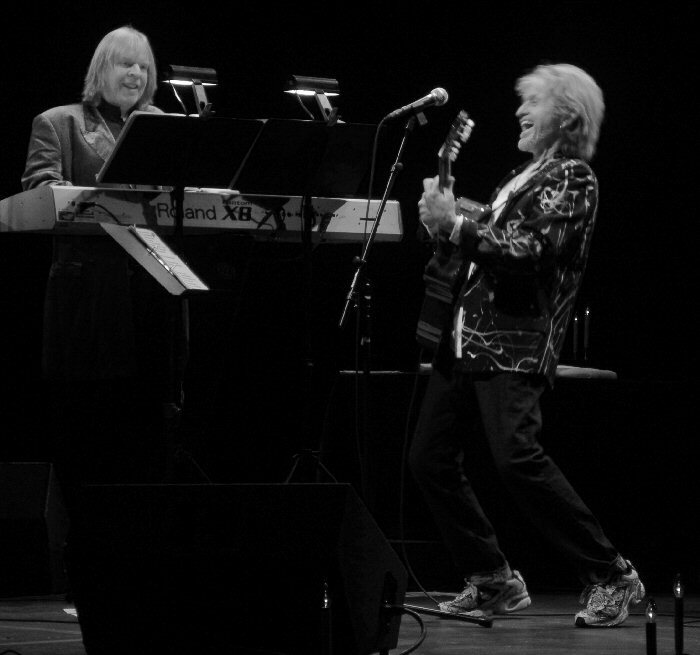 As Anderson and Wakeman took the stage the crowd was on their feet and cheering before they had hit one note. The first sounds were Wakeman's piano sounding like bells than subtly cascading into keys that mixed with Jon's strumming and singing about the sun shining. The piece flowed into the Yes classic "Starship Trooper". In this simpler format the song was surreal. The piece moved into the "Wurm" part with fans clapping along and Jon leading folks through vocalizations. As they finished the first track fans were back on their feet applauding loudly. "Sweet Dreams" was sweet with Jon in good voice singing and smiling. "Thank you so much - thanks for coming - we really appreciate it," Jon said. He commented that he cannot remember the lyrics to some of the newer songs so he moved closer to a notebook of lyrics. Rick who was quite the comedian all night joked about getting older. Jon continued talking about the power of love stating "the more you give out the more will come back to you". The next song "Forever" from The Living Tree was filled with pretty prose and piano parts. As the piece finished, Jon picked up an acoustic to provide rhythm for the classic "And You and I". Rick was effective in filling in the space of songs with multiple parts and sounds. After all, many of the Yes favorites are complex expanses of thick bass lines, stellar guitar leads and dynamic drumming. Yet, the Yes songs handled by Jon and Rick in this stripped down setting were still engaging. They returned to The Living Tree with more lyrics about love enhanced with lingering notes and lovely piano parts. "Long Distance Runaround" was different yet delightful, again with Wakeman layering parts. Jon told the audience that he became an American citizen about two years ago which led into their interpretation of Paul Simon's "America". The duo put their own spin on the storytelling. 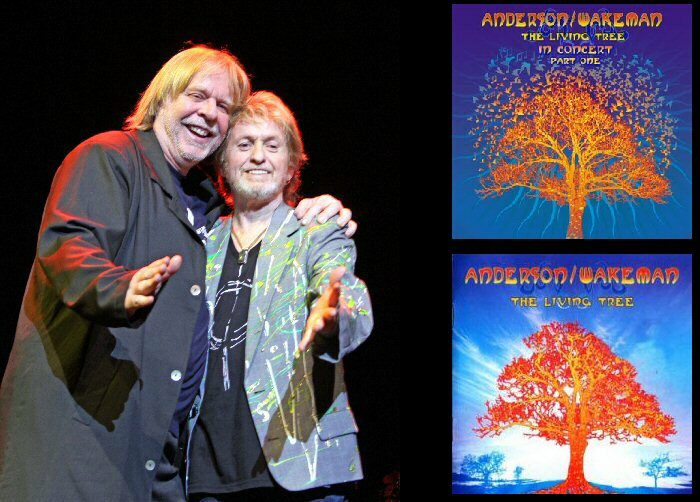 Anderson and Wakeman performed a mix of YES classics and songs from The Living Tree. Jon discussed how they worked on The Living Tree by sending MP3 files to each other. The next track was inspired with both working in their respective gardens. The song expanded on vibrant keys and visual lyrics about love, the sun and rainbows. A few more jests about getting older with Rick asking Jon do you go to the doctor more now? Jon joked that he is taking more drugs then ever. They closed the first set with a revised "Time And A Word"- with a new reggae vibe. Returning refreshed - the second set opened with the expansive "South Side of the Sky". The two continued to perform a mix of material from The Living Tree and Yes songs. Highlights included commentary and the middle section of "Awaken" with its unworldly church like organs. The song ended the second set with the two friends hugging. They returned quickly for the encore which featured a reworked "Roundabout", a shimmering "Soon" and the melodic and magical "The Meeting". 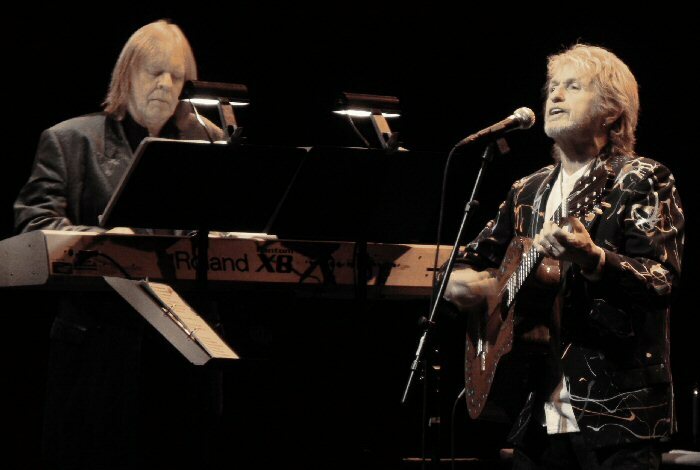 Jon Anderson and Rick Wakeman have reunited to revive their musical friendship. Based on what we saw at the Count Basie the two were relaxed and seemed to be really enjoying themselves. Both were in good form and humor. It appeared that zealous Yes fans were thrilled that the two are working together again. Hopefully, the collaborations and concerts will continue for years to come. Jon Anderson recently released "Open" on I-Tunes. It is a 20 minute composition that melds classical music with Anderson's angelic vocals. "Open" is a combination of changes and musical styles with lyrics about love and nature. It is a light and lovely piece by Jon who is enjoying his own personal revival. For us, this concert weekend had a theme of revival. As fans of Bruce Springsteen we have been watching the rebirth of Asbury Park, New Jersey since 1999. It was Springsteen who put this seashore town on the map for many in the 70's with his debut Greeting from Asbury Park. AP with its quality shops and restaurants is 20 miles south of Red Bank which also has a thriving downtown and the Count Basie Theater. In the late 60's race riots and other factors lead to the decline of Asbury Park. In recent years, there has been efforts to bring Asbury Park back to its glory days. We have been watching the resurgence for years and continue to see progress. More stores and cafes are opening. Some old favorites such as Alan & Suzi's who sell vintage clothing are still there as are Crust & Crumble a gourmet pizzeria and bakery. Before our enchanting evening we went to Asbury Park and spent the blustery afternoon on the boardwalk and strolling around the streets of this historic city by the sea. We are happy to report that the winds of change continue to blow through the town with so much musical history. In fact, for the first time since we've been following the rising of AP it's now apparent that Asbury Park is becoming an even greater musical mecca than ever before. In Convention Hall which has two theaters there are retail shops including Greeting From Geralyn. The store keeps vinyl alive in a number of formats including traditional records, clocks made of LPs and opportunities to make your own spin art on a record. On Cookman Avenue we found Russo Music a two story establishment of musical paraphernalia and instruments. Holdfast sells clothing, jewelry and records. Groovy Graveyard has vintage records, toys, posters and magazines. For up and coming artists there is Bands on a Budget who make merchandising and marketing simple and affordable. We also observed to ongoing efforts to restore the famed Upstage Club to its former glory. Yes, there is revival in Springsteen's city, the world of Anderson & Wakeman, and even the Count Basie Theater which had some major renovations in recent years making it an ideal venue for quality shows such as this one from these two classic rock legends. Musical Scenes from Asbury Park: Future home of The Upstage Club? Tillie clock by Geralyn. 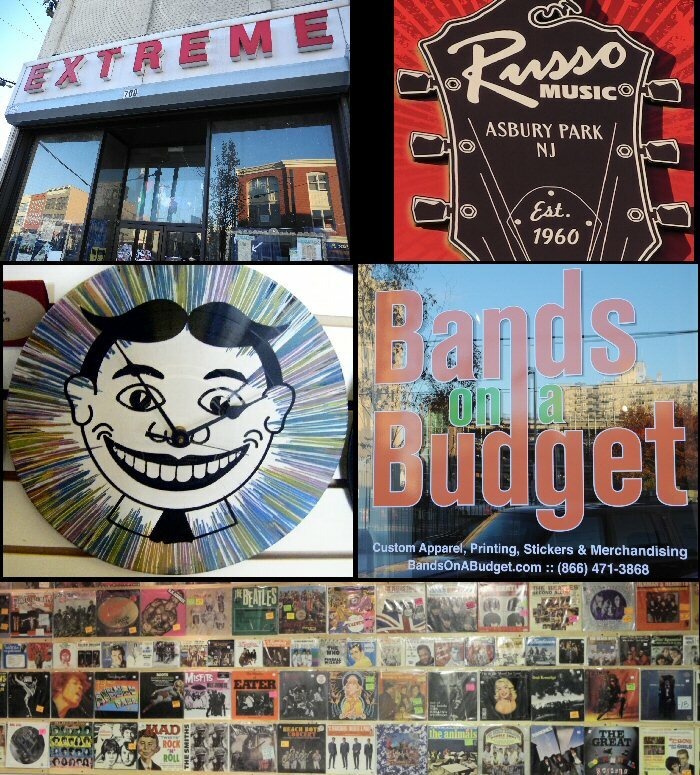 Russo Music, Bands on a Budget, and the Wall of Records at Groovy Graveyard.